Daily wine tasting with Misses Pircher and once a week we visit the winery of Merano. In addition you can learn how do open a bottle of sparkling wine with the sword. Daily winetasting with Misses Pircher and celebration of eastern with a special breakfast and unforgetable dinner of 5 corses. Daily wine tasting with Mrs. Pircher and once a week our wine gala, with a South Tyrolean winemaker and wine accompaniment of his wines. In addition, Mr. Pircher prepares every day a freshly dish of asparagus. Daily wine tasting with Mrs. Pircher and once a week our wine gala, with a South Tyrolean winemaker and wine accompaniment of his wines. We also celebrate our mothers with an elegant gala dinner with an aperitif and a 5-course meal. Daily wine tasting of white wine with Mrs. Pircher and once a week our wine gala, with a South Tyrolean winemaker and wine accompaniment of his wines. In addition, Mr. Pircher prepares every day a freshly dish of asparagus. Daily wine tasting of white wine with Mrs. Pircher and once a week our wine gala, with a South Tyrolean winemaker and wine accompaniment of his wines. Daily white wine tasting with Mrs. Pircher and daily freshly prepared fish dishes. In addition youhave the opportunity to visit the winery of Merano. Daily cider tasting with products Tälerhof of Schluderns and once a week apple wine gala with Lukas Tschenett. In addition Mr. Pircher prepares various apple dishes. After the daily wine tasting, every evening changing steak menus awaits you, prepared by the owner of the house, Klaus Pircher. In addition a summer barbecue on our terrace espects you. This week, you can expect a daily gourmet buffet with hot and light dishes and a large selection of desserts. Of course, there is also the daily wine tasting with Mrs. Pircher. Daily wine tasting with our Sommelier of south tyrolian red wine and once a week our Wine-gala with wine and stories from our winemakers. In addition you can visit the winery of Merano, just near do us. Daily wine tasting with our Sommelier of south tyrolian rosè wine and once a week our Wine-gala with wine and stories from our winemakers from Marling. In addition you can visit the winery of Merano, just near do us. Daily wine tasting with Misses Rosmarie Pircher and celebration of our traditional autunmal evening with roasted chestnuts. Once a week Wine-gala with wine and stories from South Tyrol. Daily wine tasting with our Sommelier of south tyrolian wine and once a week our Wine-gala with wine and stories from our winemakers from Marling. 3 nights with breakfast and two with half board and daily wine tasting. In addition the package includes a traditional "Törggele" dinner in the wine barrel from our restaurant Vinumgarten of 3 courses. Daily wine tasting with our Sommelier of south tyrolian Pinot Noir and once a week our Wine-gala with wine and stories from our winemakers from Marling. 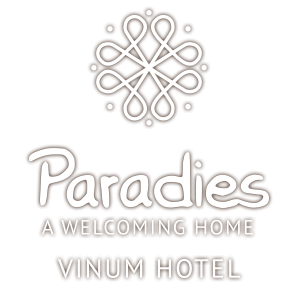 Enjoy 3 days in our Vinum Hotel Paradies with half board and daily wine tasting, with our oraline of wine from Marling as a present. Daily wine tasting with our Sommelier of south tyrolian Pinot Noir and special celebration of the end of the season with a elegant dinner.